Why Restaurants Are Abandoning The No-Tipping Policy : The Salt It's customer and staff complaints that did away with the model to start, but that's also what's bringing the tradition back to restaurants that've been experimenting with the policy to even out pay. 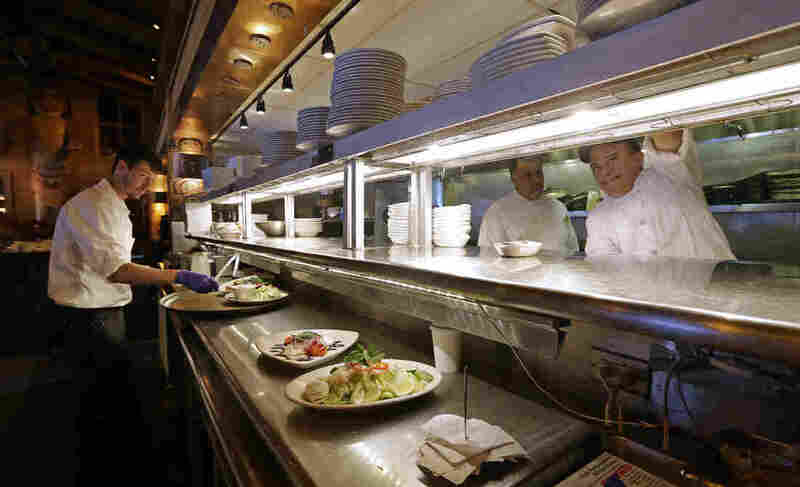 After Seattle's new minimum wage law took effect last April, Ivar's Seafood Restaurants announced it would immediately increase its prices by about 21 percent, eliminate tipping and pay all its hourly workers $15 per hour. Several other restaurants are adopting a no-tip policy to equalize the pay gap among employees, but many have gone back on that move. In recent years, there's been a no-tipping movement within the restaurant industry. The idea has been to rectify a basic pay unfairness to even out the pay between tipped and untipped employees. Dishwashers and cooks at the back of the house don't earn as much money as waiters because they don't get tips. So, do away with tipping, raise menu prices a little bit, and pay everyone a higher wage. But that experiment has failed at some restaurants. Joe's Crab Shack, the first large U.S. chain to implement a no-tip model, announced this month that it is moving away from the experiment, which only lasted three months. Restaurant owner Thad Vogler also dropped tipping for a while, but found it was too difficult to maintain. 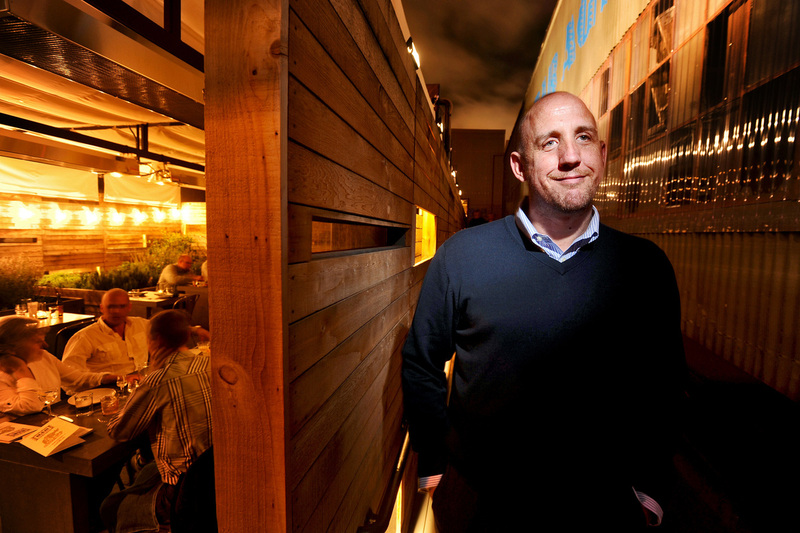 He owns Trou Normand and Bar Agricole in San Francisco. San Francisco's minimum wage law got Vogler to try it in the first place, he says. "There are a number of city mandates that are expensive, and the imminent $16 minimum wage is among those, so it's been very much on restaurant owners' minds how to compensate differently. So I'd been at a number of meetings with other restaurateurs in the city and there was a sort of sense that a number of us were going to make this shift, and I thought I would go first." In our weekly series covering the middle class, Hanging On, Vogler talks to NPR's Linda Wertheimer about why he returned to the traditional tipping model at his two restaurants, and what he might've done differently. Other San Francisco restaurants weren't making the switch, he says, but he still thinks non-gratuity policies are the future of the industry. Thad Vogler, at his restaurant Bar Agricole in 2011, says the no-tipping model didn't work out for his two San Francisco restaurants. Looking back, he would've hiked up his prices even more so the money flowed to the staff more evenly. I would say the kitchen staff was making between $13 and $20 an hour probably, and the front of the house staff was making between $25 and $40 an hour. Yeah, very much so. I would describe it that the kitchen received raises, the senior staff in the front of the house, their income remained pretty similar, and then entry-level staff took a bit of a hit in the front of the house. Attrition. We were losing staff, servers mostly. Kitchen was of course happy and turnover was nonexistent. And senior staff in the front of the house were happy. We were continuing to hire young, new people, train them, and then they'd get the set of skills necessary, and they would generally give notice and move to other restaurants in our community who were still on a traditional tip economy. Oh, they were delighted. Most of all, my management was very relieved. It had been a tremendous amount of work, and we all remain very much in favor of it, ideologically, and I, like many, think it may be the way things are going. We just started to feel like an ideologue, insisting on this way of doing it when others in our community that had said they would switch were not switching. So it really wasn't happening after a year the way we had thought it might. Financially, we wanted to be more one of the pack, while innovating more with food and drink and service. There was one primary mistake, which was thinking that somehow I wanted the prices to be basically what people were paying previously, including tip. So we knew our tip percentage was around 21 percent, so we increased all of our prices by that and charged accordingly, and then we gave the kitchen raises. So there was a bit less for the front of the house, so that was really my mistake. I know that others that are making the switch now are raising their prices by more like 40 percent to be sure that that doesn't happen.